1. On every day after Thai Amavasai, all the Perumals of the eleven Thriunaangur Thirupathis come here to Manimaaada Kovil in their in Garuda Vahanams. On that occasion Thirumangai Alwar with his wife Kumudhavalli would come from Thirunagari along with the deity he worshipped. Then to the 11 Thirunaangur Divyadesa Perumals are praised with the Paasurams (ie) the Mangalasasanam made by him is sung and finally the Thiru Andikaapu is performed. Then Thirumangai alwar would accept the garlands and honour from each perumal. Finally all would set in to a grand procession. 2. We can visit all the Six Divyadesams - Thirumanimaada Kovil, Thiruvaikunda Vinnagaram, Thiru Vann Purushothamam, Thiru Arimeya vinnagaram, Thiru Semponnsei Kovil and Thiru Thotriambalam all in just one day. 3. The Grand Garuda sevai along with the 11 Perumals of Thirunaangur Thirupathi's. 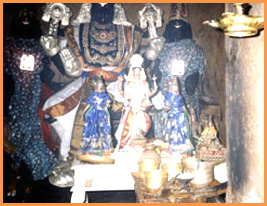 Dieties Nandhavilakku Perumal, Naranarayanar, Pundareegavalli. Pratyaksham to Indra and Ekadasa Rudras. The Moolavar of this sthalam is Nandavillaku Perumal.The Moolavar is in the Irundha (Sitting) Thirukkolam facing his thirumugham towards east direction. Prathyaksham for Lord Indra and Ekadasa Rudhirar. This sthalam is one among the Thirunaangur Divyadesam and lies in Thirunaangur in Tanjore district in Tamil Nadu. It's about 5 kms away from Seerkazhi. Bus facilities are also available.